Dispersal by budding (queens and a group of workers separate from the colony and walk to a new site). The native range of Argentine ants is northern Argentina, southern Brazil, Paraguay and Uruguay (see Wild (2004) for a thorough review and surveys). The introduced range of Argentine ants is broadly Japan, Australia (western and eastern), South Africa, southern Europe, the United States (south-west, California, Hawai'i) and New Zealand. However, Argentine ants persist in many locations only because of human modified conditions (e.g. in semi-arid areas because of irrigation). Numerous authors have covered the introduced range (see Wild 2004; Roura-Pascal et al. 2006; Roura-Pascal et al. 2011). Argentine ants were first discovered in New Zealand at Mt Smart Stadium (Auckland) during opening-ceremony rehearsals for the 1990 Commonwealth Games (Green 1990). Genetic analysis shows that Australia was the most likely source of Argentine ants into New Zealand (Corin et al. 2007a), but by what commodity or pathway they arrived is unknown. It is also likely they were introduced from a single source population, as determined by the very low genetic variation and the absence of fighting between colonies in the New Zealand populations (Corin et al. 2007b). Argentine ants are effective at recruiting foragers to, and monopolising, food resources. Workers are aggressive to other ant species and their numerical dominance leads to them displacing other ants (Holway 1999). Argentine ants have a very general diet that includes nectar, insects, seeds, carrion, and honeydew secreted by sap-sucking insects (Suarez et al. 1998). The diet of workers consists primarily of sugar, while larvae and queens are mainly fed protein (Vega & Rust 2001). 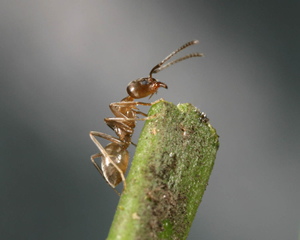 Argentine ant workers move steadily in defined continuous trails and tend to walk over objects placed on trails. Their trails can often be found along smooth surfaces, and in the urban environment they are commonly found by pulling back the grass at the edge of the footpath. Trails can often be found ascending flowering trees and shrubs. Nests can be found under wood, stones, piles of leaves and in potted plants. Argentine ants are a classic hitch-hiker pest, where within a region they spread chiefly via human-mediated dispersal (Suarez et al. 2001; Ward et al. 2005). Establishment patterns in many areas follow human transport networks (roadways and towns) (Holway 1995; Human et al. 1998). Their distribution is often patchy due to dispersal by budding off from existing colonies and jump-dispersal often through human-assisted transportation (e.g. in potted plants, rubbish, freight) (Suarez et al. 2001; Ward et al. 2005). For example in Nelson, an infestation in the port area had been established via a truck that was delivering gas bottles (R. Harris pers. obs.). Ward et al. (2005) estimated that in New Zealand humans move Argentine ants on average 10 to 72 km; much lower than estimates in southern USA of between 160 and 361 km (Suarez et al. 2001). This demonstrates that human-mediated dispersal can occur over relatively short distances (e.g. an urban landscape or even city neighbourhood). Consequently this type of small-scale spread must be considered when trying to limit the number of new populations and has implications for managing the types of pathways that are responsible for this spread. Without human-mediated dispersal, spread is much slower through budding of colonies, but local dispersal of Argentine ants has only been studied to a limited degree in New Zealand (Ward & Harris 2005; S. Hartley unpubl. data). The rate of spread due to budding is relatively slow, averaging about 150 m per year where climate or habitat is not limiting (Suarez et al. 2001), but can range from near zero in areas of climatic extremes up to 800 m per year in highly favourable, recently invaded habitat (Holway 1998; Way et al. 1997). Colonies are able to relocate and survive in response to high levels of disturbance (Passera 1993). Workers pick up larvae and eggs and relocate their nest in response to changes in weather, human activity and/or food supply. Queens appear to need workers to establish a colony successfully, but a colony with as few as 10 workers can grow quickly in the laboratory (Hee et al. 2000). Argentine ants are usually extremely abundant wherever they have established. Any suitable nesting site will be occupied, and thousands of ants will pour out if the nest is disturbed. Nests are interconnected via foraging trails, and workers are freely exchanged between them. The activity along foraging trails indicates the high abundance. Markin 1967 (in Vega & Rust 2001) estimated 50 000 – 600 000 ants ascending single trees daily. There is considerable seasonal variation in the density and distribution patterns. In favourable conditions, new nests containing queens and workers bud off and the infestation expands, whereas in adverse conditions, small nests merge to form fewer larger colonies (Davis & Van Schagen 1993). Argentine ants mostly occur between 30° and 36°C latitude in both hemispheres (Hartley et al. 2006; Roura-Pascal et al. 2011); these belts are often referred to as having a 'Mediterranean climate'. Isolated populations can establish and thrive outside these latitudes, where climatic conditions are favourable (e.g. California, 37–38.5°C (Ward 1987); Hawai'i, 20.5–21°C (Cole et al. 1992); Easter Island, 27°C (Morrison 1997)). In Hawai'i, coastal areas appear to be too tropical, and Argentine ants are restricted to higher, cooler elevations (Cole et al. 1992). In arid climates, a lack of water restricts their distribution (Holway 1998). In colder locations, Argentine ants cannot survive outside human-modified landscapes where human activities and structures create warmer microclimates (Suarez et al. 2001). During cooler times of the year foraging will be restricted, as 10°C is the reported lower limit for foraging (Markin 1970). Foragers are most active when the temperature ranges from 10° to 30°C, and they cease foraging when surface temperatures reach 32°C or drop below 15°C (Hedges 1998; Hartley & Lester 2003). Oviposition slows over the winter and development rates of eggs, larvae, and pupae slow. Oviposition does not occur below a daily mean temperature of 18.3°C, and the population reaches a seasonal low in numbers during winter (Vega & Rust 2001). Environments with high rainfall reduce foraging time and may reduce establishment chances (Vega & Rust 2001). Within a site, distribution can be patchy and related to microclimate. For example, in a citrus orchard in California, 93% of colonies were found in the south-west (hotter) quadrant around orchard trees (Phillips 1986). Although frequently associated with human settlement, Argentine ants are not restricted to modified habitats and occur in native vegetation in a number of locations. In Hawai'i, they are present in undisturbed montane habitat in dry and mesic areas, and shrubland/grassland sites, but not wet forests (Cole et al. 1992; Reimer 1993). In southern California, they occur in scrub habitat fragments, and along the edge of a large continuous area of native vegetation (Suarez et al. 1998). However, 100 m into the fragments, Argentine ant numbers begin to decline. In South Africa they have invaded the fynbos (Giliomee 1986) and in Chile the Matorral (Fuentes 1991). Information is scarce on whether substrate influences the distribution of Argentine ants. In western and southern Portugal they are common in sand and clay loam soils, but largely absent in sandy loam soils associated with metamorphic rocks, despite otherwise favourable conditions (Way et al. 1997). In New Zealand, Argentine ants have invaded numerous native habitats including scrub, mangroves, coastal forest and the edges of native forest but their potential impact on native systems remains difficult to assess, although forest habitat appears unlikely to be utilised (Harris et al. 2002; Ward & Harris 2005).